The independent transport videos cameras pay a visit to two Welsh bus museums in this programme. We start at the Barry Bus Museum where we had the pleasure of being taken out on a special journey in a former Western Welsh Plaxton-bodied Leyland Leopard coach, fleet number 177 (OUH 177G). The coach returned to the road in the spring of 2013 having been restored over many hours to return it to its ‘as new’ condition. 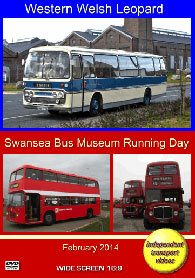 Our filming starts on a February Saturday afternoon at the Barry Bus Museum. From here we take the coach on a ‘tour’ through the lanes finishing up on the Barry Waterfront. We get both the passenger and driver’s experience with plenty of ‘drive by’ shots reminding us of a time gone by. The sights and the sound coming from the Leyland O.600 engine will bring back many memories. We also get a glimpse of a number of the exhibits that are based in the museum, which is the former Western Welsh, Barry bus depot. The following day our cameras moved west along the coast to attend the Swansea Bus Museum Running Day event on the 23rd February 2014. There is an excellent selection of buses and coaches at this museum representing the types of vehicles operated in the South Wales area. Together with visiting vehicles it made for an excellent day out. The filming starts with a view of the exhibits as well as some of the arrivals. We then jump on board former South Wales Bristol VRT3, 961 (WTH 961T) smartly presented in NBC poppy red livery – the colours that it was delivered in. Our journey takes us to the rugged and windswept Pennard Cliffs. You can enjoy the journey from the upper and lower decks as well as from the driver’s aspect along with views from the roadside. We return to the museum to see some more of the comings and goings of the buses running in service. Our next journey is on service 23, the Penlan Circular. This time we board Willowbrook bodied AEC Regent V, 586 (154 FCY) dating from 1963. This, the quintessential South Wales Transport double decker bus gives us a most enjoyable ride. Filmed from various points in and outside the bus, we hear the sounds of the AEC engine as it climbs the hills in and around Swansea as it makes its circular journey returning to the bus museum. Our final scenes are filmed at the museum as buses arrive in and depart for service and for home. If you haven't visited these two excellent museums in South Wales, we would recommend that you do. As a bonus this programme features some archive video from 1989. This shows some of the minibus and bus operations in Caerphilly and Merthyr Tydfil yet another chapter in the history of buses in South Wales.